we are just 26 days into the new year, and already i have 8 books under my belt. even if say, 5 of those books are young adult paranormal romance books. and to be honest, i'm kinda over the paranormal stuff right now. i can't put my finger on why..
but i need books that are real right now. books about real people, doing real things, overcoming real life. i need real right now, even if it's hard. even if the stories break my heart. i need to hear them. i need to be changed by them. but i'm still saving my amazon gift card for those dang design a project life page protectors. until then, i'm still on the free ebook trip. but you know what, it's not so bad. i just finished 'charlotte figg takes over paradise' last night. and i'm telling ya, it's running a close second to 'maids of misfortune' for the front runner in favorites. but i guess as they are entirely different books, they can both occupy the numero uno spot for now. i'm a big fannie flagg fan. i bet you are familiar with her work, even if you haven't read a book. she wrote 'fried green tomatoes'. and as with everything else, the book is SO much better. but this cover drew me in because i'm a fannie flagg fan. promises of a quirky cast of characters suckered me from the get go. and i wasn't disappointed. at all. charlotte figg's husband, unexpectedly drops dead, and a stray dog named lucky claims her as his own. 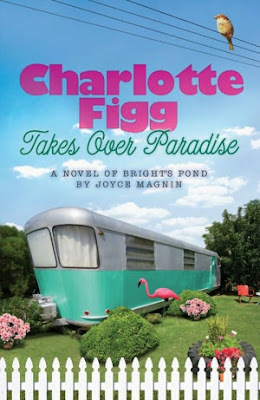 one day lucky brings home the neighbors mail, and as charlotte thumbs through it she happens upon a magazine with an advertisement for a double wide trailer for sale in a place called 'paradise'. she makes up her mind to purchase the trailer sight-unseen & that's where the story takes off. charlotte finds herself in a world she never expected, living a life she never dreamed... and oddly it's exactly where she needed to be. she lands among a community of people who didn't know they needed her & somewhere in the midst of everyday life she overcomes a past she didn't really know was haunting her. it's an amazing story. a funny, sometimes wacky story about a community of people with scars. some you see, and some you don't... and how they bond together. totally worth the read, if you are asking me.